I have the opportunity to test drive 5th Gen Hyundai Verna AT variant which was launched in India in the month of August. The 2017 Verna boasts of Futuristic Design, Dynamic Performance, Super Safety and Advanced Features. It comes with 22 new features and 11 of them are segment first. The Verna is sold in more than 66 countries and is aptly described as Global Sedan which speaks volumes about its success in the markets where it is available. While driving, I have experienced that acceleration is quick, cabin of this sedan is beautifully designed with two tone dashboard of chocolate brown and beige colors. It has ample leg room and thigh support in the front and at the rear. For a taller person like me, it provides tireless driving and comfortable sitting experience. For mainting good cooling in the entire cabib, AC vents are given in the rear also and you can enjoy the driving in extreme hot weather when the temperature rises to more than 44 degress celius in India. The new Verna has best in class cabin quietness and this credit goes to its aerodynamic profile. It has foam filler in pillar cavity and double pole sealing of door in pole to reduce wind noise. For fresh and clean air inside the cabin, eco coating technology has been used on the AC vents which prevents unpleasant smell to develop in the AC evaporator coil by degrading the bad bacteria that develops inside the AC evaporator core. Besides this, front and passenger seats are ventilated with 3 level air circulation speeds for a refreshing ride comfort in hot summer season. This is also one of the segment first features. For entertainment, it has 7.0 IPS (In Plane Switching) capacitive touch screen for wide viewing angle of 178 degree with Audio Video Navigation System (AVN). 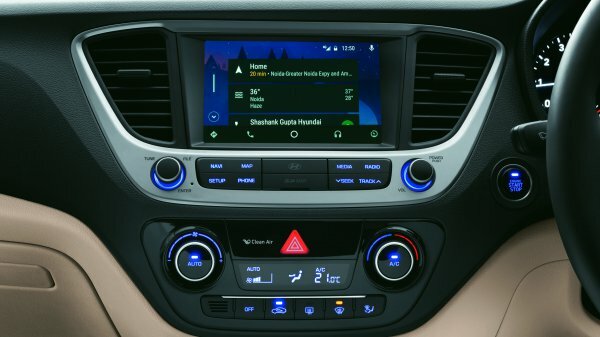 For smartphones, it has connectivity options of Apple Carplay, Android Auto, Mirror Link, Bluetooth and also for USB. It comes with 6 speakers along with Smart Surround System by ‘Arkamys’ for immersive audio experience. With iBlue smartphone app, you can control the entertainment system. It also comes with Auto Link app with various features such as checking the health of the car before you undertake long trip; provides driving information and roadside assistance; driving history, vehicle health summary and your driving pattern to name a few. This new Verna is powered by 1,591 cc Petrol 1.6 L Gamma Dual VTVT engine which is claimed to deliver 17.7 kmpl and 1582 cc Diesel 1.6 VGT engine which is rated to deliver 24.75kmpl. Both the engines are mated with 6 speed manual and automatic transmission. It is built on K2 platform similar to Hyundai’s global bestseller Elantra, and is made of 50% of Advanced High Strength Steel (AHSS), an additional 37% increase over the previous generation model. The new Verna has Chrome Cascade grille with horizontal chrome slats, Projector Headlamps with LED daytime running light with Projector Fog lamps with chrome surround. It has 2 piece LED Tail Lamp. For safety, the new Verna comes with Driver and co driver air bags and six airbags as optional feature. It also comes with reverse parking camera for safe parking. 2017 Verna is available in total 12 variants in seven colors at starting price of Rs. 7.99 lakhs ex-showroom which goes upto Rs. 12,61,900 depending upon the variants.